Back to the Future: The Game: Episode 1: It's About Time is Telltale's first game to be released as part of their partnership with Universal. It is a direct continuation of the story as featured in the films, taking place six months after the events of Back to the Future Part III. Like Tales of Monkey Island before it, the Telltale crew has consulted one of the creators of the license, in this case Back to the Future co-creator Bob Gale, in order to keep the game faithful to the films. The result is very impressive, but there are a few hiccups in Telltale's first foray into the Back to the future universe. Telltale has opted to interpret the game in the art style of their other humorous adventures, rather than using realistic characters and scenes like their CSI games. The result is very pleasing, especially considering Telltale targets low-end hardware as much as high-end hardware so they can attract as many audiences as possible. This is a good thing, as it helps keep the game out of the uncanny valley. 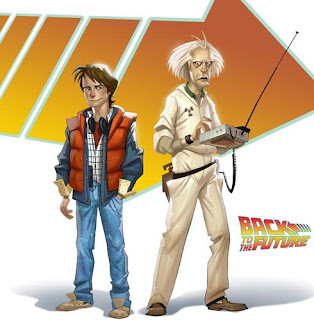 Telltale has captured the look of the Back to the Future characters very well in this style, and the characters do exude more emotion in their faces and movements than Telltale's previous games. The animation is still stiff, but they still managed to capture the erratic nature of Doc Brown well. The background images also are done well. They captured the look of the iconic images from the films, and the re-imagining of the town of Hill Valley in the a different time period was just as fun to see as it was in the films. I did notice one hiccup with the animation where characters mouths were moving when no words being spoken. It didn't happen too long, and it only happened once, so it didn't spoil my enjoyment of the game too much. In this case, the time period visited is the 1930's during the prohibition era. We also get a glimpse of the 1980's at the start of the game, and here from all of the main cast except for Marty's girlfriend Jennifer. Telltale did a remarkable job in finding voice sound-alikes. The only actor to return from the films was Christopher Lloyd as Doctor Emmett L. Brown, and he still does the character brilliantly. A.J. Locascio is just as spot-on as the marketing for the game led you to believe. It really is amazing how much he sounds like Michael J. Fox as Marty. The rest of the cast isn't as eerily accurate, but they do sound like the characters from the films. We only get to hear Lorraine, Marty's mom, in the opening, but she does a classic line from the films, and she nails it. George McFly is very convincing as well, and we get to hear more from his middle aged self than we ever do in the films. We only get to hear Biff as his pushover middle aged self, but Andrew Chaikin has his voice afflictions down. The new characters are also all voiced very well. I especially like James Arnold Taylor as the 17 year old Emmett L. Brown. He has Doc's vocal oddities down pat, and really does sound like a young Christopher Lloyd. Members of the Tannen and McFly family always show up in the past, so here we get Artie McFly, Marty's grandfather, who looks very much like Marty's dad, and sounds a lot like Crispin Glover in George McFly's teenage years. We also finally get to see Biff's father, who was absent in the films. He's a gangster named Kid Tannen, who surprisingly doesn't look or sound like Biff, but rather has a New York accent. It's a bit of a departure from the films, who always had the actors portray their relatives. However, it works well. My favorite new character is Edna Strickland. Her 1980's elderly voice is a bit jarring, as it sounds a bit forced. However, the voice is given a lot of range, so it doesn't quite jar as much as the Soda Poppers did in Telltale's Sam & Max series. Her 1930's voice on the other hand, is very well done. Her voice fits her character perfectly, and in retrospect, the 1980's voice does as well since we see how her character got to be the way she is 55 years later. As long as Telltale doesn't overuse elderly Edna in future episodes, I'm sure her character will sit just fine with most people. The music is always a high point in games by Telltale Games, and it certainly doesn't disappoint here. he thing I was glad about was that get to hear period music in 1930's, as was the case in the movies, and fans will be glad to know there's a bit of Huey Lewis and the News in there as well. As far as orchestration, Jared Emerson-Johnson does a great job blending the film's soundtrack with new music. The soundtrack that is taken from the films is the original orchestrated score, which helps bring a sense of grandeur to the game. The new music is not performed by a full orchestra, but it fits in the game just fine. As evidenced by Poker Night at the Inventory, Jared is skilled at blending different music styles together, and he does the same remarkable job here. Telltale's first episodes in any season always have easier puzzles than usual, but since they were aiming to attract an even more casual crowd than usual, the puzzles are easier than most of their first episodes. A previous interview mentioned that Telltale were taking steps to attract even non-gamers, and the problems mentioned have been addressed here. There is now an objective screen, which will tell players what they have to do next. This can be turned off in the options, with the exclusion of the intro tutorial which is similar to that found in the first episode of Sam & Max: The Devil's Playhouse. Even when the objectives are turned off, they can still be viewed by clicking the exclamation point in the right corner of the screen. The hints system has also been overhauled, getting a system similar to the Universal Hint System format, where the player can get a simple hint, a more detailed hint, or a hint that tells the player what to do. I have always liked the UHS format because players can choose how detailed of a hint they want, so I'm glad to see Telltale adopt the format in-game. I personally didn't have a problem with the easy puzzles and the catering to casual gamers, as the rest of the game design made up for it in my opinion, but it may be a problem for some. It's About Time is a great start to what looks to be another great series for Telltale Games. The story, voice acting, art design, and music all stay faithful to the source material. The story is engrossing, and it makes you want more. There are a few technical hiccups which take you out of the experience somewhat, but they happen few and far between. The puzzles are easier than a lot of adventure gamers would like, but in my opinion the rest of the game design makes up for it. The game shouldn't disappoint most people who are fans of Back to the Future and the adventure genre. Update: 12/1/15: Since I wrote this review, a remaster called the 30th Anniversary Edition has been released. The improved textures aren't really that noticeable, however they also managed to get Tom Wilson to reprise his role as Biff. The authenticity of having Tom voice Biff works really well in the situations where we get to hear the tough Biff, which we only get a taste of here, but is much more noticeable in later episodes. If you have yet to play the game, pick up the remastered version if you can. If you've already played it, it's not really worth picking up again, unless you're a big Back to the Future fan. Strong Bad's Cool Game for Attractive People, the five part episodic adventure by Telltale Games starring characters from Homestar Runner is now available for the PlayStation 3 through their PSN download service. The fourth and final episode of the first season of Doctor Who: The Adventure Games has received an early release in the UK for PC and Mac. This episode takes place right where the last episode left off, with the doctor and Amy in an undersea colony. The episode sees the return of the Vashta Nerada, the monsters from The Silence in the Library. Those outside the UK will have to wait until the game is released on Direct2Drive (for $4.95 for a single episode or available in a bundle) to play the game. A demo for Jane Jensen's adventure game, developed by Wizarbox, Gray Matter, is now available for PC from the official Gray Matter website. It is also available for the Xbox 360 in Austria, Belgium, Ireland, Netherlands, Portugal, Switzerland, Germany, Spain, France and United Kingdom. A publisher has not yet been set for North America, so North American gamers will have to wait a while for the Xbox 360 demo. PC games and demos are region free, however, so feel free to download the PC version if you have a computer capable of playing it. The fourth and final episode of the first season of Doctor Who: The Adventure Games is scheduled to be released on Christmas day, December 25, 2010 for free download in the UK. The episode will be available to purchase on the same date to those outside of the UK for a small fee. The episode takes place on Christmas, and begins right where the last episode left off, with The Doctor and Amy materializing just south of London, and about 1000 miles to the left inside an aquatic sea-bed colony called Poseidon. It is written by Phil Ford, and takes place entirely underwater, featuring the enemies first introduced in Silence of the Library and Forest of the Dead. This is the final episode for the 2010 season of Doctor Who: The Adventure Games, but the BBC has commissioned a second series of episodic adventure games which will be released next year. Sorry for the lack of posts here. I was diagnosed with a chronic disease, and it got pretty bad for a while. It seems to be in remission now, so I should be able to get this page back up and running now. ScummVM, the program that lets you play 2D point and click adventure games (such as most LucasArts, Sierra, Revolution, and Adventure Soft games) on modern operating systems and video game consoles, has recieved a huge update today with over a dozen new games added thanks to the Sierra SCI engine. Now ScummVM supports every SCI game up to King's Quest VI. Other than the SCI games, another Sierra family game has been added: Coktel Vision's Fascination. The list of supported platforms has also increased, as ScummVM is now playable on Android, Dingux, Caanoo and OpenPandora. The City That Dares Not Sleep, the season finale of The Devil's Playhouse, the third season of Sam & Max, is now available to download for Windows and Mac at Telltale's site. The Steam and PSN versions should be coming soon. Jennifer: If you would not mind, could you please clarify as to whether you made (the quote listed on the Toonstruck Two petition). Keith Arem: Yes, this correspondence is correct. We maintain all of the assets from the original production, and several of the original creators have expressed the desire to collaborate on a release of the entire project. Since the original production was fairly expensive, we are looking to demonstrate to our investors the true market potential of this release. Jennifer: If possible, (what are) your thoughts about the fan petition? Keith Arem: We would need a significant amount of fan support to push this back into production, but we are confident that the audience will justify its development. I appreciate your support, and look forward to getting this project back into production. It should also be noted that the organizer of the petition recommends that you do not donate any money at the PetitionSpot petition. He does not know where the donated money goes, and all requests for information about the matter with the founder of PetitionSpot has been so far unanswered. The third episode of Doctor Who: The Adventure games is now available for free for those who live in the UK, and for a small fee to those who live outside of the UK and don't pay the licensing fee. The episode falls into some of the same traps that kept the previous games from being as good as they could have been, but this episode does go a long way to do a lot of things right. The episode takes place entirely in the TARDIS, the doctor's living transport unit which is permanently cloaked to look like a police box. The TARDIS is much larger on the inside than it is on the outside, and that is where the fun in this episode comes in. This episode is very much fan-service, as it allows you to explore the TARDIS control area and the Doctor's reading room, which has been seen before on screen and contains artifacts the Doctor has picked up on his travels. The storyline sees the TARDIS stuck in a time vortex, with the Doctor and Amy having to find a way out. The duo's task becomes much harder once the episode's villain is revealed. I enjoyed the villain of this episode, since it was motivated by something other than hatred for the human race. The voice actors seem to be showing more emotion in their performances. There were a few flat lines, but they occurred much less than in previous episodes. The times when the Doctor and Amy were in danger were conveyed with the proper mix of excitement and fear, as they would be in the television series, which really helped to keep you engrossed in the storyline. The music and sound effects are once again great, as they sound like they would in an episode from the series. The aural portion of these episodes were always top-notch, with the exception of the vocal performances, but now the voices are nearing the same level. The puzzles in this episode are, for the most part, fun and original. The puzzles have been improved a lot since the previous episodes. I particularly enjoyed a puzzle where the collectible facts are used as part of the puzzle. I enjoyed it when the collectibles were used as part of the game in the later episodes of Telltale's Strong Bad's Cool Game for Attractive People, and I'm glad to see Sumo Digital taking the same route here. The middle of the game was hampered, however, by the same snag that hurt the previous episodes. Puzzles are repeated, both from previous episodes, and within the same game. The puzzle that I found the weakest of the puzzles so far, the maze puzzle from the first episode, is once again used here. And, just like the first episode, the puzzle is repeated (though it's only used two times this episode, as opposed to three in the first). Another puzzle also returns from a previous episode, but it is used well within the context of the game, and only happens once. It's really a shame that puzzles were repeated here, as it was really unnecessary to do so. TARDIS is a step in the right direction. The episode is fun, the puzzles are mostly enjoyable, the voice acting has improved a lot, and the music and sound effects are as good as ever. The repeated puzzles bring the overall enjoyment of the game down a bit, but this is still the best episode of Doctor Who: The Adventure games so far. Broken Sword: The Director's Cut (which features new closeup art and new gameplay) is now available for the PC through digital distribution from GamersGate and DotEmu for $9.99 US/£9.99 UK/€9.99 Euro. TARDIS, the third episode of Doctor Who: The Adventure Games is now available for PC for free for those who live in the UK (due to those in the UK paying a license fee). The for-pay version for those outside of the UK has not been released yet. The Gamescom conference (The European equivalent of the United States' E3 or Japan's Tokyo Game Show), held in Germany, revealed a new game by the French developer Wizarbox. The game stars Captain Morgane, the female pirate from So Blonde. Morgane has to prove herself as captain, assemble a crew, and sail to several islands in search of treasure. The game is once again developed by So Blonde's creator Steve Ince. Reportedly, the game is finished, but Wizarbox is still searching for a publisher. Edna & Harvey: The Breakout still hasn't received an English release, but Adventure Treff, the German adventure site, has an interview in German where a sequel or spinoff of Edna and Harvey is mentioned. There is also a picture of work-in-progress box art available. The first game has received great praise for it's German release, so a sequel isn't surprising. There is no mention of a possible release date yet. Les Miserables: The Game of The Book, the first installment of Chris Tolworthy's Enter The Story series is now free. The Enter the Story series takes classic literature and allows you to experience it through an adventure game. The game is seen through the eyes of an angel, and you connect the thoughts of the characters rather than controlling a character directly. This adds to the feel of experiencing a novel, since you feel like a narrator moving the story forward. The game has no voices, but there is classical style music that fits the game perfectly. The newest novel to receive the Enter The Story treatment is Charles Dickens' classic A Tale of Two Cities. There are now five games (including Les Miserables), with the promise of more to come. For $14.99, you get all the games plus any future games. The games all connect to each other in game, as locations from other novels can be selected inside of the game world. You can grab Les Miserables for free and purchase the rest of the novels at The Enter The Story website. According to this tweet on Twitter by a Kalypso Digital Ltd. employee, Broken Sword: The Director's Cut (which featured new closeup art and new gameplay) is getting a worldwide digital release on PC this week. There have been no digital releases of the original Broken Sword on sites such as GOG.com and Steam, despite these sites having parts two and three for sale. A PC version of the director's cut would seem a likely reason for the original to not get a digital release. So, this rumor could very well be true. The fourth episode of Sam & Max: The Devil's Playhouse offers the most cinematic experience the Sam and Max series has had so far. Nearly naked doppelgangers of Sam have appeared all over Manhattan, and it's up to the original Sam and Max to find out who unleashed them and why. The storyline of this season appears to be the most tight-knit the series has gotten so far. This episode follows right after the last one left off, and starts with a bang. We were given a bit of a taste of horror movies in Season Two's Night of the Raving Dead, but things are ramped up here. I found the game's intro to be quite spooky and nerve-wracking, despite the knowledge that there is no fear of imminent death. The game starts with the duo running into Stinky's diner, leaving Max and Grandpa stinky to fend off the Sam horde with their guns. Pudgy brown paws are reaching into the diner through the boarded up windows. Sam and Max must find an alternate route of the diner, and that is when the game really gets going. Once again, previously used locations are used sparingly this season. They are still keeping us far away from Sam & Max's office, which is as refreshing as ever, since it really started to feel stale after a while. Harry's mole man tunnels are further explored here, and are the duo's main mode of transportation besides Max's teleportation ability. There are few new characters this episode, but the returning characters are all enjoyable. I really enjoyed Bosco in the previous seasons, but, as of this episode, I'm enjoying Momma Bosco as much as her son. It would be great to see the two working together in a future season. One of the most fun part of the game for me comes from Telltale's new relationship with LucasArts. I've always loved the LucasArts injokes, and there are plenty in this game. There are Lucasfilm jokes and references to Sam & Max Hit the Road. The greatest thing is that Hit the Road situations can now be spoken by name, whereas the previous seasons had to merely allude to Hit the Road situations due to legal concerns. This really solidifies the Telltale seasons as bona fide sequels. The music is as cinematic as ever, but the music isn't as catchy as it was in previous seasons. I'm not going to be as harsh in this category as I was in my previous review, since the music works for the style of game they're aiming for. The voice acting is top notch as always. The actor of Harry Moleman seems to have tuned down his performance a bit, which will probably satisfy some fans who didn't like his voice before. The actors of Sam and Max are brilliant as always, and I enjoyed the sassy performance of the actress who plays Momma Bosco. The new characters are excellently voiced as well, and although one new character has a nasally high pitched voice, there is enough range in his performance to not be grating to the ears. I'm starting to get used to the point and drag mouse control. While I still use the keyboard to move in situations where the camera has shifted to a new angle, the mouse only control scheme is growing on me. I didn't give it a fair shot in the previous episodes of this season, but I'll admit it has improved leaps and bounds since Tales of Monkey Island. Once I realized you no longer had to click and drag the character to move, it became a lot more fun. It still gets confusing operating this way during camera shifts when the exit shifts from one side to the other, but other than that it works well. With a little bit more fine tuning, this option could really be a suitable alternative to point-and-click. Beyond the Alley of the Dolls is another great episode of Sam & Max. The storyline is fun, the characters are entertaining, the voice actors perform their roles well, and the music is fitting to the atmosphere. The puzzles are all straightforward and seem to be a nice balance difficulty-wise. I found myself stuck in one instance, and, although I didn't have to result to the in-game hint system, I did have to quit the game and come back with a fresh mindset to solve it. Telltale has been aiming for cinematic gaming experiences since Wallace & Gromit's Grand Adventures, and they have succeeded here. This is the most cinematic Sam & Max experience yet, and is certainly one of the more entertaining episodes so far. Monkey Island 2: LeChuck's Revenge was released just one year after the first game, The Secret of Monkey Island, was first released. Despite the short time between games, Monkey Island 2 was bigger in all respects. The game had more islands to visit, a larger more involving storyline, more characters, and a much larger soundtrack. The game was also the first LucasArts adventure game to use iMuse, a technology that allowed music to be changed on the fly within the game, allowing for smooth transitions between music and for several variations of the same song to be played (sometimes in the same scene). Unlike The Secret of Monkey Island, Monkey Island 2 remained virtually the same across all platforms on which it was released, up until this year's Special Edition which brought new art, music recorded from live instruments, and voice acting, along with jokes replaced due to copyright concerns. Monkey Island 2 is bigger than The Secret of Monkey Island in every area. It has a much more involving story, more music, more locations, more characters, and more islands to visit. The tone of the game is darker than the first, and that change in tone is noticible in the music. The theme is moodier than the first, although it retains the Carribean-inspired charm. The Special Edition lacks the original intro when playing the game with new graphics and music, although the original intro can be seen in it's entirety when playing in classic mode (available on PC by pressing F10). The Monkey Island 2 theme can be heard in the main menu in the Special Edition. This game also ushered in a new technology called iMuse, which allowed the game to change the tempo of music, change melodies, or make smooth transitions on the fly. Like with all of the early LucasArts titles, the game was designed with the Roland MT32 MIDI device in mind, but the game never needed one as it had Adlib sound as well. The Special Edition doesn't have iMuse, as it uses digital music tracks rather than MIDI, but it emulates iMuse fairly well. The transitions don't sound exactly the same, but they are fairly close in most areas. I enjoyed Jesse Harlin's live orchestral renditions of Michael Land's Monkey Island 2 songs, so the non-perfect transitions were a non-issue for me since the music sounded so much nicer than I was used to with Adlib sounds all these years since I never owned a Roland MT-32. The music in the classic mode in the Special Edition sound a bit off at times, but it's nothing too bad. The voice acting in the Special Edition is once again wonderful. This time the voice acting is also available in the classic mode, which is a nice bonus. The Curse of Monkey Island cast of Guybrush, Elaine, Stan, and Wally (who debuted in Monkey Island 2) are great, and the new side characters are voiced well. I didn't like Largo's voice at first, but it grew on me quite quickly. He's voiced as a typical thug, and although he didn't sound how I imagined him, the voice fit the character. The only voice I didn't like was Guybrush's mother. I don't care for forced sounding voices, and hers was definitely forced. I think they were going for a condescending tone, but they ended up with a voice that was more grating to me than the Soda Poppers from Telltale's Sam & Max series. Thankfully she's not in the game long, and her role isn't long in the parts where she is in the game, so it's not too big of a deal. The shortcomings of The Secret of Monkey Island were rectified in the sequel. The game is larger, but it's also a lot less sparse, with lots of places to go on each island. This makes the acts evenly paced, and the middle act doesn't feel like it drags on like it did once you reached Monkey Island in the original. However, this game has a couple nuances of it's own. The first game had puzzles with a pretty straight-forward logic, but this game pads the difficulty with a few odd puzzles. One puzzle in particular is nonsensical if you aren't well-versed in American English. The original game had a selectable difficulty with a easy mode and a hard mode, which isn't present in the CD version or the Special edition. You can play the easy mode in the CD version of Monkey Island 2 in ScummVM, or in the Special Edition with a patch from LogicDeluxe on the Mixnmojo forums. The Special Edition does come with a hint system, which would really come in handy on some of the more dubious puzzles in the game. The control system in the Special Edition is much better than that of the Special Edition of the first game. The verb bar and inventory are still hidden, but this time objects can be clicked on, and an icon of three or four choices of verbs can be chosen. It is kind of like the verb coin in The Curse of Monkey Island, but it's not quite as simple to use as that. The shortcut keys from the first Special Edition can be used here as well, and since I became so used to them last time, this method was my preferred method of playing the game. In the classic edition, just like last time, the full verb and inventory system of control is still used. A few jokes have been changed in the game due to copyright issues, but the designers chose appropriate alternatives which are just as funny, or sometimes funnier than the original. A few new jokes have been added into the art, just like last time, so the game is a treat for those who like easter eggs. This game is just as deserving as its status as a classic as the original. This game took what was great about the original and made it better. The story is bigger, there is a lot more music so the game never is quiet (and the iMuse system helps make the atmosphere feel alive through the music), and the personality of the characters are extended upon in believable ways. This game fixes some missteps from the first game as far as pacing goes, but some of the puzzles use a bit off odd logic. I'd recommend the Special Edition purely for the voices alone. Like The Secret of Monkey Island, the voices really add a dimension to the game that wasn't there before. The performances of Dominic Armato as Guybrush and Earl Boen as LeChuck in the more intense moments of the game really add to the feeling of tension, much moreso than was possible with pure text. Update: 2/19/11: There is one more option available since I first wrote this review. There is now a a fan made patch available at the Mixnmojo forums that adds the speech from the Special Edition to the classic game. Like the fan patch for the first game, it also fixes bugs. The Special Edition is required to play this version of the game, so I still recommend picking up the Special Edition. I don't recommend this one over the Special Edition as I did the first game, since the fan patch lacks the live music due to the iMuse system in the original. If you are a purist and just want to play the original with voices though, this option is now available to you. According to the press release, TARDIS, the third episode of Doctor Who: The Adventure Games will be released for free in the UK on August 27. The game puts players in direct control of the TARDIS, and will feature monsters and new dangers for the doctor and Amy to overcome. The game will be for sale for those outside of the UK on the same date as the UK release. The price point for the non-UK version has not yet been announced. CSI: Fatal Conspiracy is a new game in the CSI Las Vegas franchise, once again developed by Telltale Games. Unlike previous games in the series, however, the five cases in the game will connect into one overarching larger case, much like Telltale's episodic series. A separate game, CSI: Unsolved, will be released for the Nintendo DS. This game is being developed by Other Ocean, who developed the Nintendo DS port of CSI: Deadly Intent. The Secret of Monkey Island was first released in 1990. Since then, there have been many different versions of the game. The storyline and puzzles remain the same throughout its various incarnations, but the graphics, sound, music, and interface have underwent some major changes throughout the years. In this review, I am mainly going to review the latest version, The Secret of Monkey Island: Special Edition, but I will point out the differences in the other versions as well. The game follows the exploits of a teenage boy named Guybrush Threepwood, who washes up on the shore of Mêlée Island seeking to become a pirate. The game is broken up into four parts, which is a formula every later game in the series would follow as well. 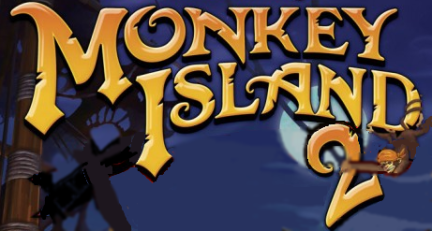 The first part has Guybrush having to prove himself to the pirate leaders through three tasks so he can become an official pirate himself, the second part finds Guybrush having to harness the power of Voodoo to get to Monkey Island, the third part takes place on Monkey Island itself, and the final part is a showdown with the game's villain. The game is long, but for the most part well paced. The third part on Monkey Island does seem to drag a bit compared to the rest of the game, due to it being so desolate, but the few quirky characters that inhabit the island make up for it. The sword-fighting scene also becomes tedious when replaying the game due to it's repetitive nature, but I did find it quite fun on my first play through. This game was a huge turning point for LucasArts adventure games. Their previous games had limited interaction with the game world. Indiana Jones and the Last Crusade made great strides with the addition of a look command which allowed Indy to comment on his surroundings, and the addition of dialog trees which gave him a choice of what to say to people he encountered. The Secret of Monkey Island took these new at the time features and improved upon them greatly. The look command would be used to enhance the humor of the game, as some of the funniest jokes in the game come from Guybrush's observations. The dialog tree system that was created for The Secret of Monkey Island would become the standard for LucasArts adventure games, and adventure games in general, for years after this game was made. In The Last Crusade, the choices were made just to solve a puzzle. If you chose the right dialog choice, you would not have to fight a guard. That was the extent of the interactivity, but in The Secret of Monkey Island, you were given a dialog option which would result in a response from a character which could then branch out into another dialog option, and so on, depending on which one you chose. Talking to characters really felt like talking in a conversation, so it gave the game a sense of realism that had mostly been lacking in adventure games up to that point. The interface stayed mostly the same up until the Special Edition. The game had nine verbs to choose from in a bar at the bottom of the screen, which was cut down from 15 in the Last Crusade, in order to simplify things. The original EGA, VGA, Amiga, and Atari ST version had text for inventory items, as was used in previous LucasArts adventure games. The VGA CD, Sega (Mega) CD, FM-Towns (a Japanese computer), and Macintosh versions had icons for inventory items, which was first introduced in Monkey Island 2. The verb and inventory bar was completely removed in the Special Edition (except in the iPhone version, which had a small bar at the bottom of the screen). The verb icons could be brought up by a button (ctrl in the PC version) and the inventory could be brought up with another (alt in the PC version). This sounds like a good solution, but it does not work well in practice. Combining inventory icons is difficult, since every time an item is selected, the verb goes back to the default. You have to open up the verb selection again in order to choose use, then open the inventory selection again to use the item. It's much too cumbersome. There is a solution, and that is the use of keyboard shortcuts. It does not replace the simplicity of the original system, bbut it takes a lot of the headache out of the game. The shortcut keys are very logical as well (O is open, U is use, etc.). The game can be switched back to the VGA CD version with the original interface at any time, so if some of the puzzles are a challenge with the new interface, such as the puzzle where you give grog to the prisoner, you can switch to the classic version (F10 on the PC version) and then back when the puzzle is over. I found that once you get used to the shortcut keys, inventory combination was quick enough without having to resort to the old interface, but your experience may differ. The graphics have been changed many times throughout the game's various releases. The original EGA version had a sunset over the sea behind the SCUMM Bar which would change to night as the game went on, which was a feature that wasn't used in any other version. This version also had an extra joke about body builder Charles Atlas that was removed for legal reasons. All of the versions except for the CD versions and Special Edition (since it was based on the VGA CD version) had a joke at a stump in the forest that asked to insert non-existent disks. The Sega (Mega) CD version omitted some graphics (such as the man spinning on the chandelier in the SCUMM Bar) due to memory constraints. This version also had censoring (replacing the word hell with here for example), which was a common requirement for console releases at the time. The original versions had cartoonish closeups, whereas the VGA CD, Macintosh, and FM-Towns version had realistic closeups of the characters. The biggest change in graphics, is of course, the Special Edition. The graphics are in high resolution, but stay in spirit to the originals. The backgrounds are particularly well done, with added detail such as ships docked behind the SCUMM Bar, which further illustrate the storyline that the pirates on the island are too scared to sail of to sea due to the game's villain, Captain LeChuck. The backgrounds were rushed in parts though, and pixels from the original version can still be seen at times. This doesn't happen too much, but if it bothers you, patches have been made for the computer versions by fans to fix these graphic omissions. This version omits the picture of the Pillsbury doughboy and Sam & Max due to legal reasons, but they are still there in the original classic version included with the Special Edition. There are new references in the art, with Purple Tentacle from the Maniac Mansion series replacing Sam & Max and Grim Fandango's Manny Calavera hidden in the background art. The characters are mostly well done, but Guybrush is a bit odd. His eyes are fixed in a blank expression, and he has a weird punk haircut. I did find that it became less distracting as the game went on, but admittedly I'm less of a purist than most die-hard Monkey Island fans. The closeups of the characters once again use a cartoonish quality, which are similar to the Curse of Monkey Island style, but not exact. I personally thought they worked well, with the exception of Guybrush, who had his odd lifeless eyes here as well. The music has always been a high point of the Monkey Island series. The original game had a score composed by Michael Land and recorded digitally, with the Roland MT32 sound device in mind. The MT32 wasn't required, but the original floppy versions of the game had MT32 support, but the CD versions used pre-recorded digitally produced audio on CD audio tracks. The Special Edition of the game is composed by Jesse Harlin based on Michael Land's original score, and is recorded with live instruments. This version of the game also adds in ambient sounds in some places where there was originally silence. Each version of the soundtrack is spectacular, though I personally prefer the music of the Special Edition. It is true to the spirit of the original music, while bringing an orchestrated feel to the game that helped make Curse of Monkey Island feel larger than life. The biggest addition in my opinion the Special Edition brings over the other versions is the addition of voice acting. The game had been developed in an era where voice acting was out of the question since games had to fit on multiple floppy disks, a single one of which only held up to one and a half megabytes depending on the type of floppy drive used. The voice acting really breathes new life into the game. The original voice acting cast from Curse of Monkey Island is present, and the voice actor of Otis returns from Escape from Monkey Island. The voice of the sword master in Escape has been replaced, but the voice actor in the special edition handles the character well. I was especially impressed with the multiple recordings of the sword fighting insults. Guybrush would sound unsure of himself when he said the wrong insult, which really brought a new dimension to the game which was completely impossible with pure text. Note that the voice acting is not available in classic mode, however. This oversight was rectified in the special edition of the second game, but the classic version mode in The Secret of Monkey Island: Special Edition still remains text only. The Secret of Monkey Island is now considered a classic for a reason. The game is really funny, the story line is interesting, and the game is challenging yet the puzzles are logical. The game does bog down pacing-wise in some spots, but the interesting characters will make any feeling of tediousness a short lived one. Any version of Monkey Island is well worth picking up, but I personally recommend the Special Edition. The interface is clunky, but once you learn the hotkeys it becomes infinitely more enjoyable. Even with the odd design choice of Guybrush, and the few missed pixels that damper the art, the music and voice acting make up for it. Plus, the classic VGA CD version can be played at any time with a press of a button, making it enjoyable even to those who can't see past the Special Edition's slight shortcomings. Update (9/19/10): There is one more option available since I first wrote this review. There is now a a fan made patch available at the Mixnmojo forums that adds the speech from the Special Edition to the classic game. It also fixes bugs that crept up through the many code changes the game went through in its many iterations, and adds jokes back in that were removed (such as the infamous stump joke and the closeup of Spiffy the dog in the SCUMM Bar). The Special Edition is required to play this version of the game, so I still recommend picking up the Special Edition, but if you aren't turned off by 20 year old 256 color VGA graphics, this is the version to play.